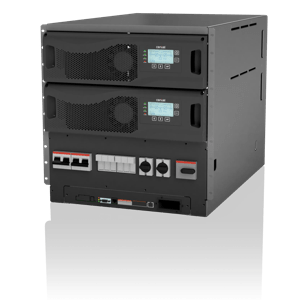 CumulusPowerTM is comprised of modules with power of 10, 20, 25, 50 and 60 kW, which can be accommodated in single racks with total power ranging from 20KW to 600kW. In addition, the power Racks can be extended to 3,6 MW by horizontally paralleling up to 60 modules. 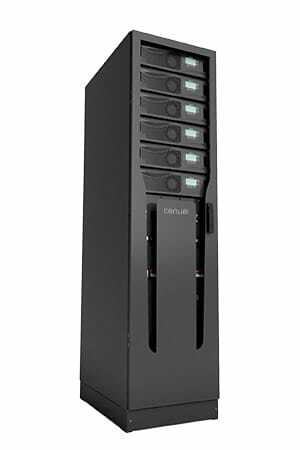 The CumulusPowerTM range is designed to protect small and mid-sized Datacenters as well as other mission critical applications with a maximum power of up to 3,6 MW. The higher the Availability, the lower the downtime. By eliminating any single point of failure, adding active-redundant technology, preventing human error and reducing the time to maintain and repair, Cumuluspower™ delivers an industry leading Availability of 9 nines to fulfill the needs of the most critical power applications. CumuluspowerTM takes downtime from seconds, to the milliseconds level. Availability is formally defined as the MTBF/(MTBF+MTTR). Cumuluspower™ maximizes the Mean Time Between Failure (MTBF) while minimizes the Mean Time To Repair with a series of futures. Multi frame connection is one of the advantages of horizontal scalability. Communication between frames and modules is critical, nevertheless for some architectures it is still a single point of failure. CumuluspowerTM parallel communication is provided with a unique triple-mode parallel bus, that consists of three independent communication lines and three independent electronic circuits. Disconnection or short-circuit on any of the lines does not represent a risk for the system thus eliminating the single point of failure. Some UPS architectures still use centralized critical components like a Single Bypass Architecture (SBA). Centralized components in a parallel system represent single points of failure. Unlike the centralized architectures, Centiel’s modular UPS, CumulusPowerTM, is equipped with a Distributed Bypass Architecture (DBA), that brings full redundancy even in the bypass line, avoiding any system’ single point of failure. Parallel system availability increases with the reduction of the Mean Time To Repair (MTTR). 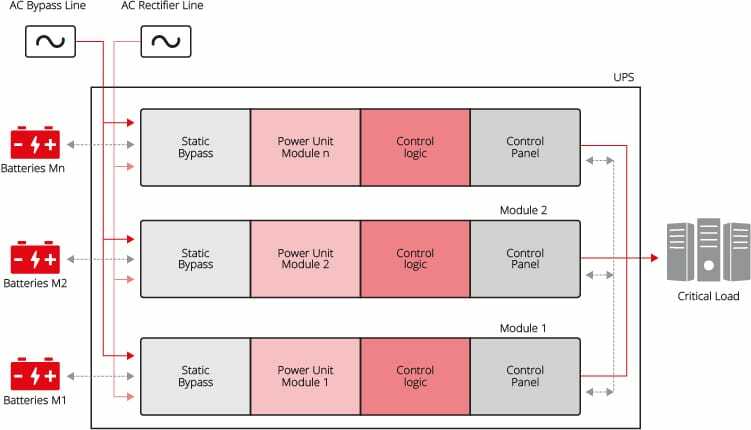 In-frame per-module bypass fuses minimize the time it takes to reestablish a system in an event of output short-circuit. CumulusPowerTM battery tests are programmable and safe. Smart Battery Booster architecture, allows the UPS to perform battery monitoring, tests and health status diagnosis without the need for mains disconnection. CumuluspowerTM modules can be swapped without the need to switch over the load to bypass. Besides that, a per-module parallel isolator fiscally isolates the module from the system minimizing human error and increasing Availability. 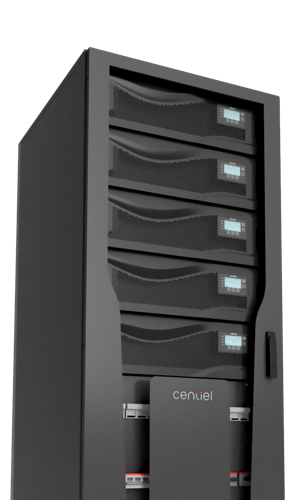 Compared to a standalone UPS solution or centralized bypass architectures, Centiel’s scalable modular UPSs have a lower total up-front investment cost, allowing you to grow your power protection capacity at the pace of the demand. Thanks to our DARA architecture and Smart-Battery-Booster, every switch over in the event of mains failure is taken smoothly, minimizing in-rush current, avoiding generator destabilization and hence eliminating the need for generator oversizing. Back-feed protection embedded in every module, maintenance bypass, bypass fuses and battery DC breakers embedded at the frame level eliminate the need for external components connections, reducing your total system cost. Batteries represent a substantial part in a project cost structure. With CumulusPowerTM you have the flexibility to select the number and type of battery blocks that best fit your design. Letting you decide in a case by case basis the best way to optimize total system cost. CumulusPowerTM industry-leading VFI 97% efficiency and its flat efficiency curve, contribute to low energy losses and heat dissipation, reducing the size and cost of cooling system. Charging batteries was never better and faster. CumulusPowerTM high charging current capability achieves 233% more charging current than its closest competitors. This means faster charging time compared to standard UPSs in the market. CumulusPowerTM fits on a 19” (IM10/20) to provide the maximum flexibility to the final application. Centiel’s flexible solution approach can customize a frame solution to satisfy specific needs. Because is not only about the UPS but the whole system. Think Flexible, look at the big picture and reduce your system cost. Use energy only when it is needed. CumulusPowerTM product line implements an intelligent MEM, that uses as many modules as necessary to match the load demand. MEM looks for the most optimized energy efficiency point, if load demand decreases and a lower number of modules can handle the load while maintaining redundancy, the superfluous modules enter into active-sleep mode to optimize overall energy consumption. Active-sleep modules are ready to instantly take any load shall it increase. High efficiency means less heat dissipation, thus, less energy wasted. CumulusPowerTM lets you reduced your energy consumption on power protection and cooling system. Maintenance is an important factor to increase availability. CumulusPowerTM product line was designed to reduce the number of components that need replacement while at the same time reduce the time and cost of such maintenance operations. Due to technology reasons, AC capacitors need a periodic replacement. This preventive maintenance is important to guaranty availability. Centiel has designed an easy to maintain mechanism that simplifies the process while reducing the total cost of the operation. Once installed, every kWh counts. Reduce Total Cost of Ownership. CumulusPower ™ service tools allow technicians, to connect, download events, verify configuration and change parameters of the UPS with a simple tap of the screen. The mobile and tablet app provide a full toolbox to read and interpret the health of the system. Power capacity upgrades and module substitution are two critical operations where any human error can compromise the system load. To eliminate such risk every single module in a frame can be fully isolated from the parallel system thanks to the parallel isolator. Such isolator allows technicians to perform a full module test and parameters configuration in a running system without the need for load disconnection or commutation to bypass. This feature eliminates the possibility of connecting a faulty module to the parallel system that could compromise the connected load. Embedded into the module as standard, back-feed protection, Increases service personnel safety, reduce total system cost and avoid external components. Simplify usability, maintenance, service and literally human machine interface. With CumulusPower ™ graphical user interface it is easy to read measurements, parameters, messages, alarm and any parameter of the UPS. Thanks to our extensive failure analysis research and insights gathered from 25 years of ﬁeld experience working with a large number of data centers and other critical environments, our power protection solutions have reached the highest levels of availability to reduce downtime risk, avoid costly errors, and increase energy eﬃciency. To respond to highest availability requirements i.e. 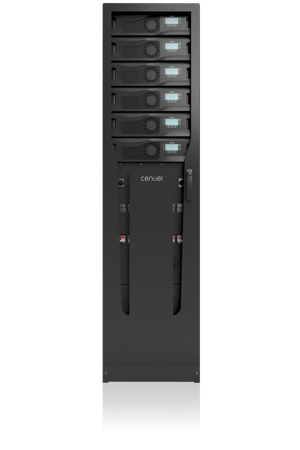 to eliminate risks that may cause computer downtime of business-critical applications, CENTIEL has developed a new series of modular fault-tolerant 3phase UPS-systems called CumuluspowerTM (CP). Unlike traditional centralized parallel multi-module systems, the advanced Cumuluspower technology combines a unique Intelligent Module Technology (IMT), with a fault-tolerant parallel architecture, called Distributed Active-Redundant Architecture (DARA), thereby fulﬁlling the highest availability and reliability requirements. The Distributed Active-Redundant Architecture of the multi-module UPS-system CumuluspowerTM was designed to respond to the highest availability requirements. This is achieved with the implementation of the “democratic” majority load trans fer decision-making in an event of a critical failure, and a correct management of the load sharing to avoid crosscurrents between the modules. The communication between the logic circuits of the modules is accomplished by means of a redundant communication BUS. In an event of a critical failure, every module will make a decision, by means of its logic circuit, whether the load should remain on the inverter or be transferred to the bypass. The load transfer will be conducted depending on the decision made by the majority of the modules. In order to avoid crosscurrents between the modules, a master-slave load sharing technique is adopted. The ﬁrst module is designated to be the master, which provides the load value to be shared by the rest of the modules (slaves). If the master experiences a failure, the next module will automatically become the leading master. 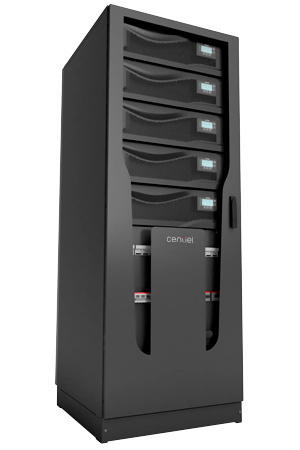 Thanks to our long experience in module-design, the CumuluspowerTM modules are equipped with all hardware (power circuits) and all software (intelligence and monitoring) functions, which make them fully independent and capable of safely isolating themselves from the multi-module system whenever an internal fault occurs. The rest of the multi-module system will continue to provide protected power to the critical load without interruptions. The integration of all hardware and software in each module allowed us to eliminate all the risky single points of failure that would compromise the entire system and the power to the critical data center. CumulusPower ™ fits on a 19” (IM10/20/25) to provide the maximum flexibility to the final application. Centiel’s flexible solution approach can customize a frame solution to satisfy specific needs. Have special requirements or application? Let us know, we’ll fit your design.